Physical silver demand soared to a record in 2013, according to the Silver Institute’s World Silver Survey 2014, published Wednesday, May 14, 2014. Trays of American Eagle silver bullion coins produced at the San Francisco Mint. Demand for the silver coins was unprecedented in 2013. Demand for silver jumped 13.3%, led by a 76.3% increase in retail investment in coins and bars. The report shows 245.6 million ounces of silver coins and bars were needed in 2013 compared to 139.3 million ounces in the prior year. The World Silver Survey 2014 correlates to sales of one-ounce American Eagle silver bullion coins from the United States Mint. Silver Eagle sales surged to 42.675 million coins in 2013, an annual record. The pace has picked up this year with 20.71 million sold so far, or 666,500 more than the amount moved last year by this time. 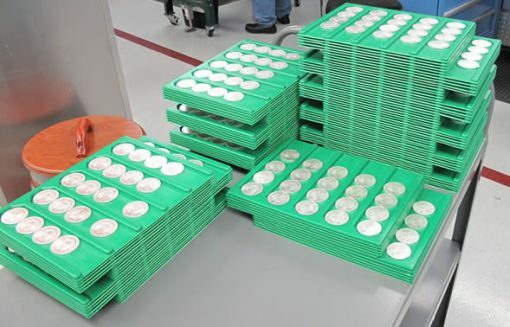 Sales of the 2014 coins have been rationed since their release on Jan. 13. Overall, silver demand reached 1,081.1 million ounces in 2013 versus 954.4 million ounces in 2012. Industrial applications continued as the largest component of physical silver, though demand in this category dipped 0.4% to 586.6 million ounces from 589.1 million ounces. Behind the need for coins and bars was silver for jewelry, up 9.6% to 198.8 million ounces from 181.4 million ounces. Silver mine production increased 3.4% to 819.6 million ounces from 792.3 ounces previously. Mexico led producers, followed by Peru, China, Australia and Russia. Primary silver mining costs stood at $9.27 an ounce last year while the average price of the precious metal was $23.79 an ounce, the third highest nominal average price on record. The Silver Institute’s report on the global silver market has been published annually since 1990. The World Silver Survey for 2014 was independently researched and compiled by the GFMS team at Thomson Reuters. The Silver Institute (www.silverinstitute.org) is a nonprofit organization that was founded in 1971. Poor man’s gold is the best bargain in the world. I bought my first ingot, a cameo of Abraham Lincoln, minted by Silver Towne in 1966. I paid $6.50 for it. Silver was $4.25 and ounce. Today, silver is $19.36 and ounce. With inflation, it should be at least %300 an ounce. Buy it, when you get the e-mails, and stock it. When I bought my first $20 Double eagle, 1926, I bought it for $48. It was in a Capital holder and I would say it would go at least MS-64. Without a doubt, I could command $2,000 for it. But, I did give it to my daughter for her wedding, in 1995, to give to her first born. He’s now 13 and has no idea what it’s worth. At the time, gold was $26 an ounce and yesterday gold closed at $1,293. Silver is an infinitely collectible metal, and each year more is produced than the last. It is a marvelous store of value, and can yield extraordinary returns for proof versions from mints all over the world. One market for the David Carrs out there is the production of fractional US Eagles. It would not be counterfeiting, and you could produce any quantity and always have buyers. Maybe the US Mint could produce fractional Silver Eagles, and include them in an enlarged silver proof set. Maybe they could make uncirculated eagles and put them in the UNC. sets. People WILL buy them, and the mint need only produce to demand, eliminating excess costs. How about it, mint folks? Fractional Proof and Unc. Silver eagles. Make it a new set. Very cool to see it.